A conference on criminal justice reform was held this past Saturday at Tulane University. The conference, hosted by the libertarian organization Students for Liberty, discussed what has been accomplished so far and what still needs to be done. About 70 attendees participated in the conference, including some who came from as far away as San Antonio. The organizations that participated stretched across the political spectrum but the conservative groups that took part included FreedomWorks, Americans For Prosperity Foundation, The Pelican Institute, Right on Crime, and the Grassroots Leadership Academy. The Republican Liberty Caucus of Louisiana, Turning Point USA, Conservatives Concerned About The Death Penalty, Convention of States, and Americans For Prosperity Louisiana all had tables at the event as well. The first two speakers at the event were from a New Orleans-based organization called Operation Restoration. Operation Restoration works with women who were recently freed from incarceration and helps provide them with education and employment training opportunities. Executive director Syrita Steib-Martin spoke about the unique challenges women face while incarcerated and the difficulties ex-cons face after getting out of prison. She also spoke about some of the reforms enacted here in Louisiana to improve the quality of life for incarcerated women such as providing for unlimited sanitary napkins. She also spoke about the importance of “ban the box” on college and job applications. “Ban the box” legislation eliminates the question on job and college applications asking whether or not someone is a convicted felon. Louisiana was the first state to “ban the box” on college applications. Steib-Martin spoke about what led her to take up a life of crime. As a child, she was abused and sexually assaulted. The repressed trauma led her to make terrible decisions and wind up in prison. The theme of child abuse and trauma would come up several times from the former inmates that spoke. There was also a panel featuring state policy experts that discussed what more needed to be done on the state level. One topic that came up was ending civil asset forfeiture, which Arkansas just did. Under current laws, your property can be seized even without a criminal conviction. Forfeited property is a major source of revenue for many police departments and prosecutors. What Arkansas and three other states have done is require a criminal conviction before someone’s property can be seized. The panelists urged Louisiana to follow in the footsteps of Arkansas. 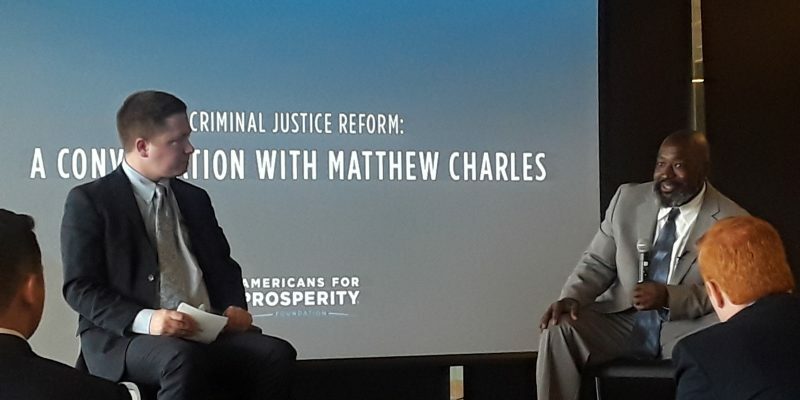 The conclusion of the conference was an interview with Matthew Charles, who was the first man released under the recently enacted First Step Act. I was struck by how he endured his unfair prison sentence and how he relied on his faith in God and Jesus Christ and how it helped him put his life back together. All in all, Students for Liberty and the Young Americans for Liberty chapter at Tulane did a wonderful job hosting this very informative conference. It was interesting to learn what has been done so far on criminal justice reform and where we need to go from here.